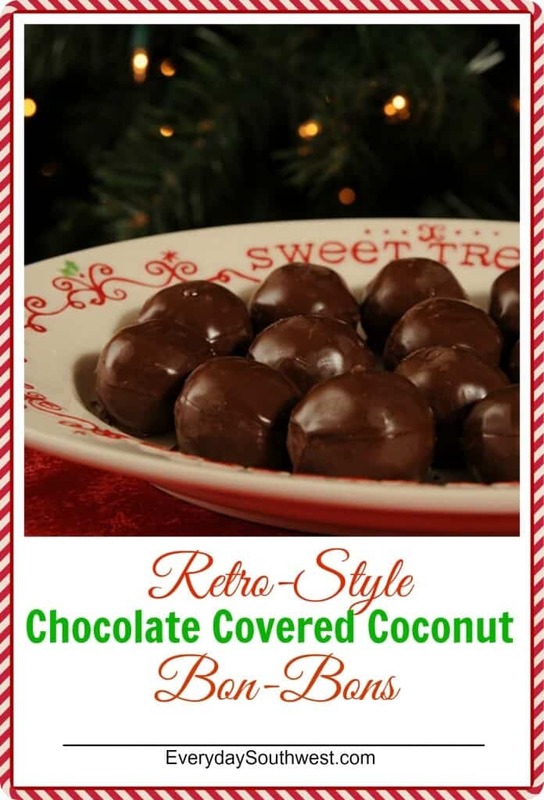 We’re bring the ’60s Holiday Cheer back with these Retro-Style Chocolate Coconut Bon-Bons! These little bites have been the star on our family’s Christmas Cookie Trays since I was the size of Cindy Lou Who. Christmastime in the ’60s was a world of its own—a shiny, rocking, aluminum Christmas tree with flashing lights world— a world made for kids. Neil was on the moon, Elvis was in Hawaii and all of us kids were gathered around our cabinet sized television set watching A Charlie Brown Christmas and Rudolph the Red Nose Reindeer. Mom was busy re-arranging the tinsel we had hung on our real pine tree after spending days in the kitchen baking little cookies and treats to give away for holiday gifts. Nothing can bring back those childhood memories with all their excitement and wonder more completely than a favorite family recipe. Chocolate Coconut Bon-Bons are one of those memories for our family. The little chocolate dipped treats were the star of my mother’s Christmas Cookie trays and we all looked forward to “sneaking” a few when she wasn’t looking each year. I won’t tell you exactly how many year’s ago I was the size of Cindy Lou Who but, I will tell you that Mom’s Chocolate Covered Coconut Bon-Bons have never missed a year of being on our Christmastime table. Mom’s recipe is the star of this year’s Christmas Week so, I know you will want to try it. Just scroll on down to the bottom of this post to find the recipe and see the list of all of the other entries into this year’s Christmas Week. Welcome to Day 5 of Christmas Week 2015! Welcome to Day 5 of Christmas Week. This annual event was started in 2012 and is hosted by Kim, the blogger, photographer and creator of Cravings of a Lunatic. This year we have over 35 bloggers sharing festive sweet recipes for the event. Plus we all chipped in for a huge Amazon Gift Card Giveaway so be sure to enter! 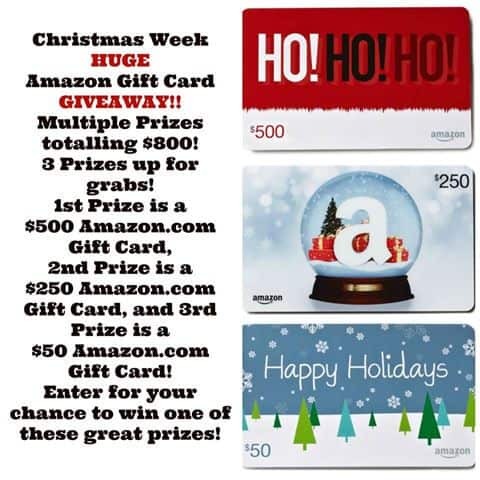 1-$500 Gift Card to Grande Prize Winner PLUS 1- $250 Amazon Gift Card and 1-$50 Amazon Gift Card !! Be that winner! Enter as many times as you would like by using the Rafflecopter on this page for easy ways to enter. In a large bowl with a large sturdy spoon, stir together coconut, powdered sugar, butter, milk, almonds and vanilla. The mixture will be very thick! Cover and refrigerate for at least 2 hours (I once left this in my fridge for a week and it was just fine). Remove coconut mixture from fridge and roll into balls about the size of a walnut. In a small saucepan, melt the parafin. Slowly stir in chocolate chips and keep over very low heat. Using a sturdy toothpick, dip coconut balls into melted chocolate and set on a sheet of wax paper to cool. Do you have a favorite Christmastime recipe from your childhood? Let me know, I’d love to hear about it! You can always reach me by leaving a message in the comments of this post or by leaving a comment on the Everyday Southwest Facebook Fan Page. « Habanero Orange Marmalade PLUS a HUGE Amazon Gift Card Giveaway! Oh my goodness, these sound so good. My sisters and I make a lot of candy this time of year. We will have to try these. I love baking! I usually make a ton of cookies, a lot of banana bread, and some homemade fudge every year!! My favorite treat to make for the holidays is chocolate covered peanbut butter balls. They are soooooo good!! I have loved them since I was a kid. I love chocolate covered coconut. I may have to break down and fix these. But then I’ll eat them. But that’s good! I love making pumpkin bars with cream cheese frosting! YUMMY! My sister started making them, and I HAD to learn how to make them. They are so amazing. I love to make chocolate covered buckeyes! OK wow. These sound delicious!! And easy enough that I might can make them!! I love making “Santa Cookies.” They’re chocolate chip cookies with white and milk chocolate chips and before baking I press two red and two green m&ms into top. I love old timey recipes this time of year. I have some of that parafin too from when I got on a cake pop kick. Just may have to try these! I like making the thumb print cookies with the jam in the middle every year for my family. Ah, Cindy Lou Who. We just watched How The Grinch Stole Christmas and Charlie Brown Christmas over the weekend. It’s funny that my kids are growing up with the same TV specials that I did. These retro bon bons look so fun! I like the idea of a signature cookie. For me it’s mom’s shortbread, though my brother would probably say her run balls. Brings back memories of playing Bobby Hull hockey–the table top game with the metal players you slide back and forth using wire levers. I love the 60’s, though I’m pretty certain at the time my mom was thinking more of dolls than me. I love retro desserts and these bonbons are no exception. 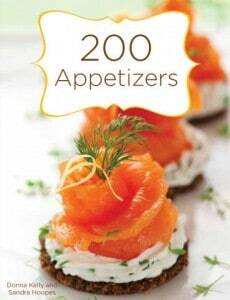 I would love to make these for our holiday table this year. They look amazing!! I could eat these all day long, every dang day. Thanks so much for joining us for Christmas Week. Sandra, I love these bonbons and your recipe sent me looking for cooking grade parafin. Which brand do you use and how much is a “cake”? My favorite sweet (and simple) treat to make is chocolate pudding pie. Oh my goodness! these bon-bons make me long for my youth, and fore, and for happy Christmases when I pretended not to notice that there were fewer on the plate than before I turned my back. Let’s make some this year! I had to leave out the almonds because my little one is allergic, but his recipe still worked perfectly! Thanks bunches! I just might have to make these a family tradition at our house, too. These bon-bons were a huge hit with the family! Because I was in a bit of a hurry I took a shortcut. Instead of refrigerating the coconut mixture for 2 hours, I put it in the freezer for an hour and 20 minutes and then proceeded with the recipe directions. They turned out fantastic! For Christmas Eve I’ll be making a double batch. I made these and brought them as a hostess gift to a party and the hostess loved them! She called me later to ask for the recipe. Great recipe!